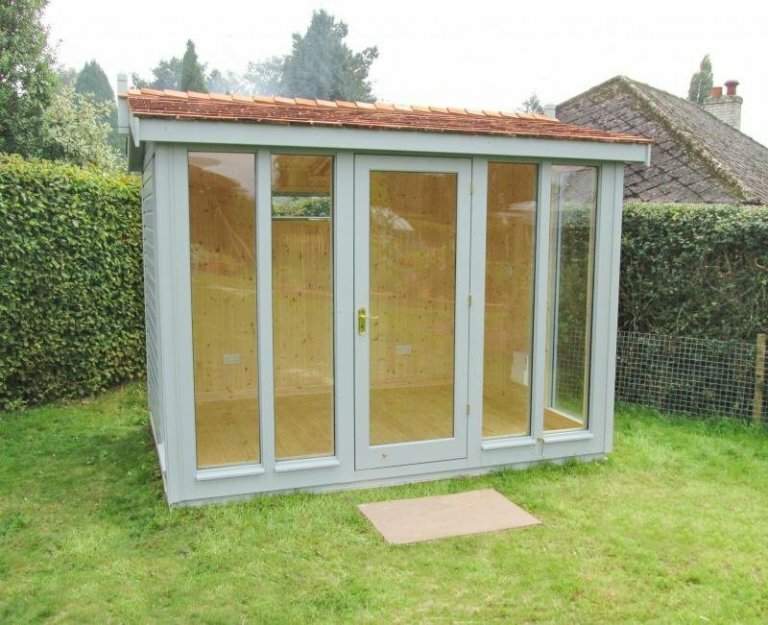 Overlooking our customer’s lovely cottage garden, this 2.4 x 3.0m Burnham Studio has been installed in Petworth, West Sussex to use as a reading room to enjoy their garden from. With a few bookcases, a comfortable chair and some lighting, this will be a wonderful spot for the customer to retreat to when they want to settle down and read the latest novel on their collection. 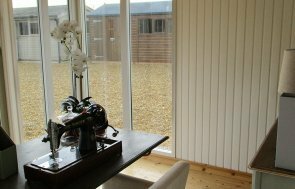 The Burnham is one of our more contemporary buildings in style, as it has full-length glass windows and doors in the front side that wrap around to the gables, offering the customer a wide-angled view of their garden, and allowing plenty of natural light inside. 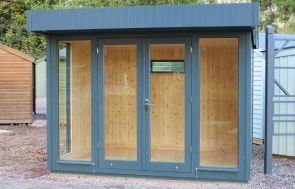 Our range of Garden Studios all come fully insulated with natural matchboard lining and double glazing as standard, making them perfect year-round usage garden buildings. The customer also chose to have a Natural lacquer on the floor to protect the wood to give it a nice sheen, and an electric pack, so they will have power to enable her to plug in a lamp, a heater in the winter, and a radio, giving her the comforts of home in this garden building. Cedar shingle tiles have been used on the roof, and the building has been painted in the green colour Verdigris from our Valtti Paint Range, giving a long-lasting, opaque coverage of paint in a natural colour. 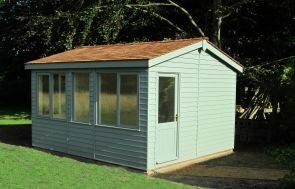 For more information on our range of Garden Studios please Contact Us, Request a Callback or call us on 01760 444229 to speak to our helpful team. Alternatively, you can visit our East Sussex Show Centre to see our extensive range of timber garden buildings for yourself.